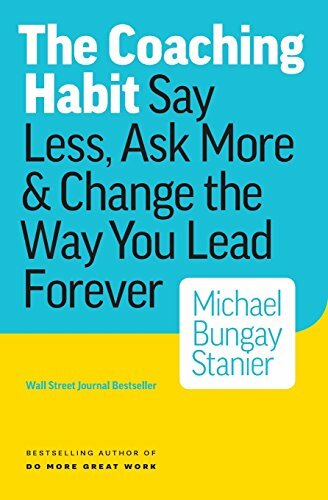 “The Coaching: Habit Say Less, Ask More & Change the Way You Lead Forever” by Michael Bungay Stanier is a straightforward book about effective coaching skills for leaders of all kinds. The title says it all. Ask more and say less is the foundation of Mr. Bungay Stanier’s coaching philosophy. As a certified leadership coach from George Washington University, I was very interested in what Mr. Bungay Stanier had to say about effective coaching. He hits the nail on the head by suggesting that coaches get out of their own way. Instead of “helping” to find solutions or giving advice, the best coaches are great listeners, asking questions that will most likely draw out answers from the coachee, which empowers them in the end. It’s more difficult to refrain from giving advice than it seems. The author provides seven essential questions for coaches to ask to be most effective. The kick-start question leads the charge, and while it’s the most basic, it’s also a powerful beginning to a potentially productive conversation. “What’s on your mind?” is the first question that is great to use to start a conversation. The awe question follows with “And, what else?”. These two questions alone can pack a punch and lead a person to the real issue at hand. The author mentions that the key for the coach is to stay engaged, and not lose interest while the coachee is talking, as looking bored can backfire on the coach. As the book goes on, each essential question can really help someone find the issue, along with possible solutions on his or her own instead of having a supervisor provide answers, which does not empower the individual. I really enjoyed this book and plan to use it in my own life as I coach others. I highly recommend “The Coaching: Habit Say Less, Ask More & Change the Way You Lead Forever” by Michael Bungay Stanier to anyone who leads others, as well as parents and anyone interested in building relationships with meaningful and empowering conversations.